Take the hassle out of finding a car park. For only $12 you can pre-book a car park at theatre Car Park - just a short walk to the theatre. The theatre car park is available from 5:45pm Monday to Friday, and from 2 hours prior to the show time on Saturdays and Sundays. The car park closes 30 minutes after the end of the performance. If you return to the carpark after it has closed and wish to retrieve your car please call the 24 hour Simple Security helpdesk on 021 680812. Getting to our theatre car park. Vehicle entry to and from this secure car park is at 94 Jellicoe Street. An ASB Waterfront Theatre front of house team member will be onsite at the entrance to assist you. We are using the ticketing system to handle bookings for the car park. This means some words are a little confusing. 1 'seat' equals 1 car park. The start time shown is the opening time of the car park. Wynyard Quarter is still growing, so please be aware that there will be road works when you are visiting the ASB Waterfront Theatre. We suggest allowing extra time to travel to the theatre if you are driving. 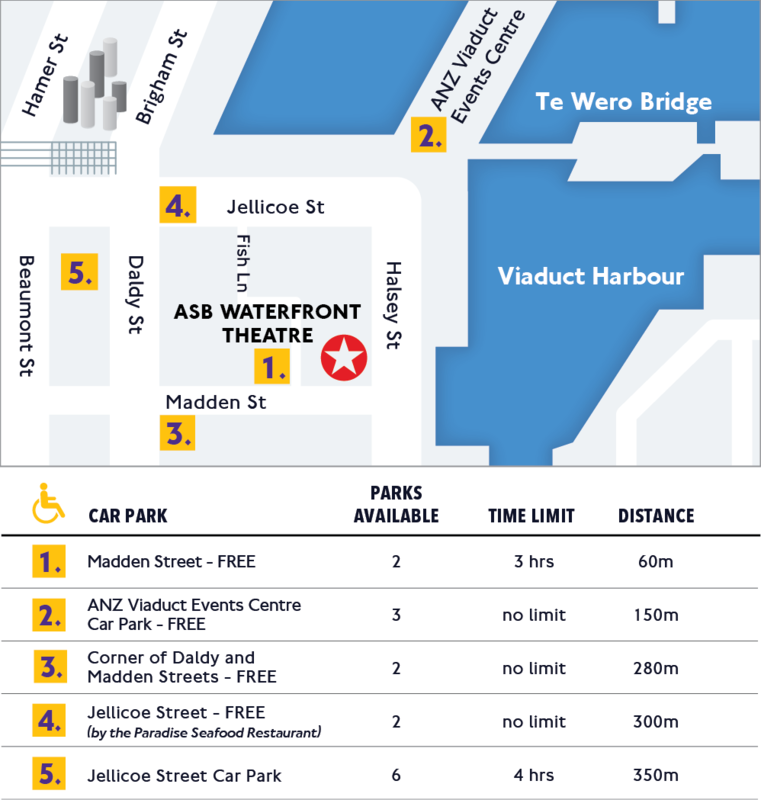 There are a number of car parks available in and around Wynyard Quarter. Use our guide to find the best car park for your event. To ensure a car park when you arrive, we suggest pre-booking a car park in the theatre Car Park. If you require a public mobility car park, please refer to our map to find the best car park for you. Find out more about accessibility at the theatre by scrolling down the page. Rails to tether bikes to can be found outside the entrance of the ASB Waterfront Theatre and on Madden Street. There are three bus services coming regularly into Wynyard Quarter. The City Link route runs from Wynyard Quarter to Britomart, up Queen Street, along Karangahape Road and back again. The 75 bus service connects Wynyard Quarter and Glen Innes via Remuera Rd and Newmarket and the 20 bus service connects Wynyard Quarter with St Lukes via Kingsland and Ponsonby Road. All three services are frequent and regular and run from early in the day until late at night. To find out how to use public transport to get to the theatre from your location, see Auckland Transport’s public transport journey planner. For those who like to cycle, there are bike stands outside the theatre on both Halsey and Madden Streets where bikes can be tied to and left. We're committed to making a visit to ASB Waterfront Theatre easy and enjoyable for as many people as possible. If you need to book wheelchair-accessible seats, or if you require assistance with your booking, please email boxoffice@atc.co.nz, phone our box office on 0800 ATC TIX (0800 282 849), or talk to us in person at the box office. Warning: strobe lighting, lighting that produces stroboscopic effects, smoke machines and other theatrical effects may be used during shows in our venues. If you have concerns about any of these elements being in a performance that you are coming to see please contact our Box Office team on 0800 ATC TIX (0800 282 849) (Monday - Friday 9am - 5pm) who will be able to confirm what effects will be in use. Please note that this may not be instantaneous as we may need to contact the company to get more information. We offer a complimentary coat check service, but we do appreciate a small koha to keep this service running. The coat check is open 2 hours before every performance and closes 30 minutes after the performance has finished. Coat check is located on the ground floor next to the elevator. Photography, audio or video recording of performances is strictly prohibited. Latecomers may not be admitted into the auditorium unless there is a suitable break during the performance when cast and other audience members will not be distracted. Please switch off any electronic devices that may cause disturbance to the audience or cast. We welcome parents to bring their kids to family events, but age restrictions, suitability and ticket prices may vary – please check event information before your visit. Children aged three years and older must have their own ticket and sit in their own seat. Children aged two years and under may be admitted free of charge but they must be seated on their caregiver’s knee. Some family shows may require children two years and under to be admitted with a paid ticket, this will be stated on the event. All minors must be with a caregiver at all times. Caregivers must be aged fourteen or over. We have changing facilities on the ground floor. One in the accessible toilet in the ladies and another in the unisex accessible toilet. ASB Waterfront Theatre is breastfeeding friendly. You are welcome to breastfeed your baby anywhere in our venue. You can grab snacks and soft drinks from the Halsey St Kitchen or the bar in the AUT Atrium. Complimentary water is also available. Pushchairs and buggies are not permitted inside the auditorium. We have a coat check where you can leave your items including collapsed buggies and pushchairs during the performance. This is open two hours before the event and 30 minutes after the end of the event. We have booster cushions available for all performances. Speak to a member of ushering staff if you require one. If you have lost something please call our box office. We keep all lost property for one month before donating it to charity. We endeavor to contact the owner of lost property through our booking records. If we are unable to then we submit any identification cards or passports to the Auckland Central Police Station within three working days. What if I purchase tickets and then can't attend the performance on the date I selected? Exchanging tickets is an exclusive benefit only available to Auckland Theatre Company subscribers. This is a complimentary no-reason-required ticket exchange service. All we ask is that you return your ticket to us at least forty-eight hours in advance of the original performance and nominate your preferred new performance date for that play. This service is not available for ATC Snap A Seat or for tickets not bought as part of a subscription. All tickets purchased are non-transferable and non-refundable. Terms and conditions apply if you are exchanging tickets from a preview or matinee performance, a premiere performance or out of an ATC Theatre Club booking. Ticket exchanges can only be made once Auckland Theatre Company’s Box Office staff have received your original tickets or proof that your tickets have been destroyed. Prior to this, no exchange will be processed nor seats reserved. Tickets can be exchanged to any other available performance within the same season of the same show. Tickets cannot be exchanged from one show to another or from one season to another. Courier: ASB Waterfront Theatre, 138 Halsey Street, Auckland, 1010. Please be sure to enclose your postal address, new preferred performance date and daytime contact number, along with any applicable payment. You can also visit the ASB Waterfront Theatre or Auckland Theatre Company’s office, Monday to Friday, between 9.00am and 5.00pm. We can process the exchange while you wait. In most cases, tickets can be replaced free of charge. Call us on 0800 282 849 and we’ll make sure replacement tickets are waiting for you at the venue. For Auckland Theatre Company shows, concession prices are available for full-time students, members of recognised entertainment organisations, and people 25 years old or younger. Presentation of an appropriate ID will be required at ticket collection. Concession tickets must be picked up from the box office. For other shows at the ASB Waterfront Theatre, other conditions may apply. Some productions and events may incur booking or credit card fees at point of purchase. If we didn't answer a question here, please give us a call on 0800 ATC TIX or see our Terms and Conditions. Preview performances are the first performances of a season. They are likened to public dress rehearsals – and priced at a cheaper rate. Premiere performances are in the first week of a season. We offer a special price on Auckland Theatre Company shows if you see the show in the first week!